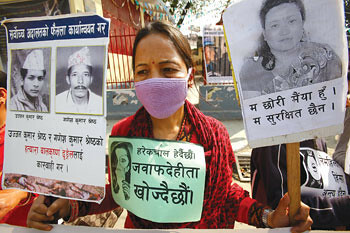 The International Day for the Right to the Truth on 24 March is an occasion to remind ourselves that victims and their relatives have a right to know to the fullest extent possible the fate of loved ones who were disappeared, tortured, raped, and killed during the Nepal conflict. Right to truth (R2T) has special relevance at a time when those with power are threatening those who seek truth and justice. But why should truth and justice matter to people outside the circle of direct conflict victims when former enemies agree that raking up war atrocities would endanger the peace process? Last Friday, President Ram Baran Yadav approved an ordinance to set up Nepal’s long promised Truth and Reconciliation Commission (TRC) as part of a political package deal to set up an election government. The ordinance contains a provision that the TRC may recommend amnesties and fails to clarify whether this will include grave violations of human rights such as torture or forced disappearances. If the recommended amnesties entail such crimes, the Commission will not meet international standards. There is a misconception that truth can be traded for justice through the work of a ‘Truth Commission’. A precedent is the South African Truth and Reconciliation Commission which was empowered to grant amnesty for politically motivated crimes including torture and forced disappearances in exchange for an apology and full self-disclosure of crimes. But is perpetrator remorse enough? If the South African TRC was established today, it would not meet current international standards. The victims of grave human rights violations have a right to redress while being protected by domestic legislation as well as international legal norms. It is neither for the government nor an independent commission to decide whether or not that right will be upheld. The right to truth is known as an ‘autonomous’ right. The victims’ right to know the fate of relatives stands in addition to their right to justice. In a courtroom, the process focuses on determining the guilt or innocence of the accused. The goal is not to satisfy a victim’s demands to know what really happened. Court cases may, but very often do not, reveal information about the circumstances surrounding a criminal act, the causes and facts of abuses, and most importantly, the whereabouts of a victim’s remains. This means the verdict may be determined in court without fulfilling the right to truth. The right to truth also has the character of a ‘collective’ right, meaning it is also articulated as a community’s right to know the history of its own oppression. Civil conflicts involve direct acts of violence, but they also leave social, political, and economic legacies that linger long after a peace agreement. Nepalis are entitled to government institutions that respect and uphold the rule of law. Yet, known and alleged perpetrators of wartime excesses occupy senior positions in the military, police, and government. The right to truth therefore takes on a society-wide character beyond close relatives of victims. Knowing the truth about the past is necessary to ensure that Nepal does not relapse into violence in the uncertain days ahead as a chief justice-led government attempts to hold new elections in a tense political environment. R2T is also a moral imperative because understanding the oppression of fellow citizens is a crucial part of consolidating peace and renewing rule of law in a country divided by war. Should a TRC move ahead as planned, the voices of victims could be sidelined in favour of perpetrator amnesty. With the guilty from both sides holding senior positions in the state mechanism, there is active collusion between the Nepal Army and Maoists to keep the truth buried. The Maoist party has threatened activists demanding the detention of Balkrishna Dhungel, who was convicted by the Supreme Court itself to life imprisonment for a murder in 1998. How is the chief justice-led government going to handle other cases of Rajendra Dhakal, Maina Sunuwar, Arjun Lama, and many more? The ordinance provides discretionary power to the TRC, which may recommend amnesty for serious crimes. But the Commission should not be a court which values ‘the standard of proof’ more than the pain of victims. It is only the victims who can forgive or decide whom to forgive. Perpetrators cannot pardon themselves. If left unaddressed, the grief of relatives of victims will fester and turn to revenge. Ram Kumar Bhandari’s father was disappeared by the Army in 2001 and he is now coordinator of the National Network of Families of the Disappeared and Missing Nepal (NEFAD).